Mr. Radcliffe joined DeHay & Elliston, L.L.P. as a partner in the Baltimore office in 2002. Previously, he was a partner with Church & Houff, P.A., and an associate with Tydings & Rosenberg in Baltimore. Mr. Radcliffe has been a member of the Bar of the State of Maryland since 1986. 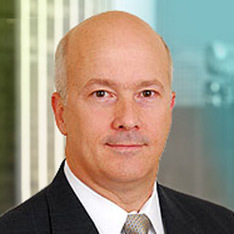 Mr. Radcliffe is also licensed in Pennsylvania, Virginia and the District of Columbia. Mr. Radcliffe concentrates his practice of law in mass tort litigation and insurance defense. He has trial experience in many of the Circuit Courts of Maryland as well as in states other than Maryland. He has tried or participated in the trial of cases in California, Georgia, Louisiana, Mississippi, New Jersey, Ohio, Pennsylvania, Tennessee, Texas, Virginia, Washington, D.C., and West Virginia. Mr. Radcliffe maintains a trial case load on a national level and actively supervises attorneys in jurisdictions throughout the country. Mr. Radcliffe is AV rated by Martindale Hubbel.